Click the article's title above the teaser to read the full post. As work and house moves have faded away the lure to go out and stand in a forest to have mud and stones thrown at me after standing in cold, damp conditions for an hour beforehand has risen. 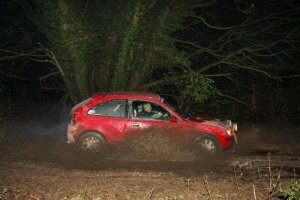 Last year I wandered across to Wales to watch the rally on the Friday/Saturday with partial success. The partial bit being despite getting up at an early hour the crowds to get into Dyfi and Gartheiniog had to be seen to be believed and accordingly I missed a chunk of the first run. related, the first being bad enough but the second is potentially fatal for the event. the Course and twice previous winner Adrian Gladwin navigating their Proton Coupe. of all at the finish! Very proud! Having been a member of West Essex since 1970, I very sadly decided late last year to transfer my allegiance to Chelmsford MC, as they seemed to be very active in many disciplines, and I had been marshalling on some of their events the previous year and had bumped into several old faces such as Geoff Lobb and Gary Nicholls.